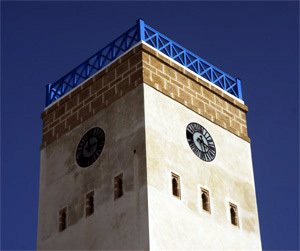 The French General Maréchal Lyautey ordered the construction of the clocktower in the new Kasbah 1912. He was Resident-General of French Morocco from 28 April 1912 to 25 August 1925. To schedule an appointment at a specified time does not necessarily mean that the person will arrive at that time exactly. Rather later or when it's convenient. Essaouira is a small town usually described as place with a laid back athmosphere. To meet people there are common places like the souk, mosque or at the resident aera at lunch or dinner time. The Islamic calendar, also known as the Muslim calendar, is a lunar calendar consisting of 12 lunar months in a year of 354 or 355 days. Being a purely lunar calendar, it is not synchronized with the seasons. With an annual drift of 10 or 11 days, the seasonal relation repeats about every 33 Islamic years. It is used to date events in many Muslim countries (concurrently with the Gregorian calendar), and used by Muslims everywhere to determine the proper days on which to fast Ramadan and perform Hajj, in addition to celebrate other Islamic holy days and festivals. The first year was the Islamic year beginning in 622 CE during which the emigration of the Islamic prophet Muhammad from Mecca to Medina, known as the Hijra, occurred. Each numbered year is designated either H for Hijra or AH for the Latin anno Hegirae (in the year of the Hijra). Starting from the 1960s, however, on the initiative of the Académie Berbère of Paris, some Berbers have begun computing the years starting from 950 BC, the approximate date of the rising into power of the first Libyan Pharaoh in Egypt, Shoshenq I, whom they identified as the first prominent Berber in history (he is recorded as being of Libyan origin). For example, the Gregorian year 2010 corresponds to the year 2960 of the Berber calendar. To be considered valid salat (prayer), the formal daily prayers must each be performed within their own prescribed time period. The period within which to offer valid Maghrib prayers is the shortest of the five periods of the day. Most other scholarly opinions hold that the time for Maghrib prayer ends when the time for Isha'a salat begins. There is disgreement amongst Sunni scholars as to when that occurs. According to the Hanafi school, Isha'a begins when complete darkness has arrived and the yellow twilight in the sky has disappeared.